Click here to register/buy AtomicRobot Information Manager 6.1! 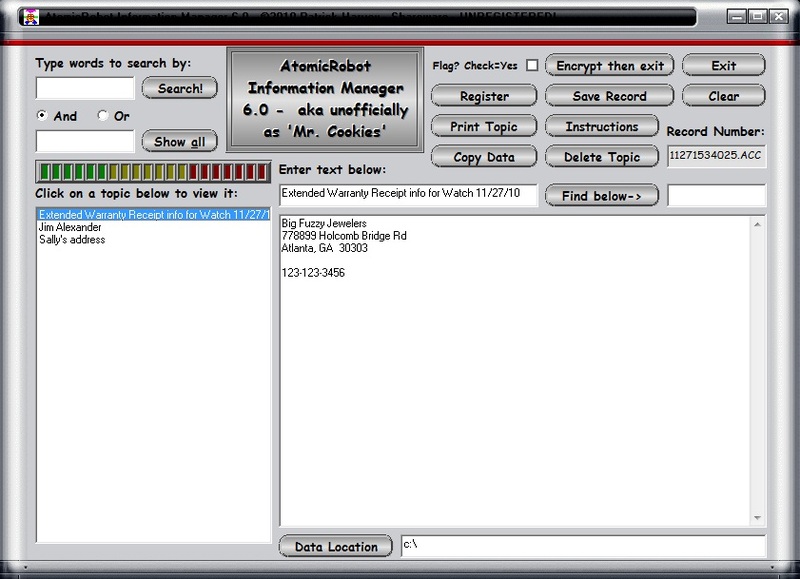 AtomicRobot Information Manager 6.1 allows you to easily store, find, and protect information important to you! Whenever you need to save important information, simply type it in or paste it in and click Save! Later, you can search for your information using any word contained in the text you saved. Search matches are highlighted when a matching article is viewed. You can also password protect your data! Whether you need to save phone numbers, personal information, passwords, or any text at all, this program is for you! This newest version of AtomicRobot Information Manager 5.0 now includes a whole new look: new buttons, a new skin, progress indicators and more! All data is now read into memory for faster searches. This is an incredible program! Try it! 6) Search for a word or phrase and display the titles of all documents that contain the search item. 7) Perform an AND or an OR search! 8) Encrypt your data using powerful encryption whenever you choose. 9) Highlights search matches when a document is viewed.